The Cool House: What's that funky smell? For a little while now, well more than a little while - more like weeks in fact, I've noticed this weird smell when I've come into the house. Now smells, I've discovered, are like the annoying pinging noise your car makes that ONLY YOU can hear. You take the car to the garage, you drive your beloved around in it. Can they hear it? No way, it's a figment of your imagination. You are a crazy person right up until the moment when the wheel comes off or a cable snaps and then they're all "Didn't you notice it before? Weren't there any warning signs? Hmm, like that whirring, pinging, humming noise I kept mentioning, you mean? Anyway, there was a definite smell. I thought at first it was rot. But we treated the rot back in, oh October, and I couldn't see any more elsewhere. That didn't stop me from obsessing about it, though. I started in the basement with a flashlight and poked and prodded every beam, joist and random piece of wood I could find. Then I moved onto the house proper. I touched every piece of siding I could, every door and window (even though most were replaced with new units in 2005) and then I got crazy: I started sniffing all the wood. ALL. THE. WOOD. Even if it meant, and it did, crawling along the floor inhaling the aroma of baseboards. Crazy. And fruitless. But just as I was going to call in a professional with a moisture meter I made a discovery. The small was worse just outside the door to the garage. And it was much worse when the heating was blowing hard. 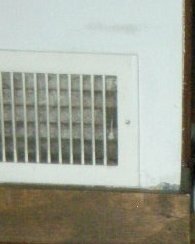 I bent down to look at the air vent and woah! I had discovered the origin of the pong. Several months ago I was taking the cat litter tray to the garage when I tripped and spilt tons of kitty gritty. Obviously I vacuumed it up, I'm not that much of a slob, but I'd failed to see that quite a bit had landed in the air vent. Eeeuw and phew. We unscrewed the grill, cleaned it, took all the dirt that had accumulated with the cat litter and voila! No more odd odor. I may be the worst housekeeper ever but at least I'm not crazy and we don't have rot. I'm glad you had a happy ending. (Nice image of you sniffing all the baseboards.) If only the problems with cars could be solved so easily.